Pretty scary when you look at it that way. But, there are things you can do to prepare for THE BIG TEST. Preparation is the "KEY" to success in passing any test including the NCLEX and the Nursing Board Exam. I have some tips that I would like to share. Actually, these tips can be used by anyone for any test! Try to study with a classical music playing in the background! Find a nice cozy, quiet corner where you feel comfortable and there are no distractions, turn on your classical music and begin to study! It really does help to retain information! Another tip: Try to get up EARLY in the morning to study when your refreshed from a good night of sleep. It will help you tremendously. After studying for a bit, take break or take a walk! Being test smart is also a help. By being test smart, I mean being able to pick out the KEY words. What are they asking for? Sometimes they will give you tons of information but in reality it is NOT important to the answer. Make sure you re-read a question if you are not sure! Look for those keys, they are usually there and many questions will have them highlighted! Also, there are some words that are DEADLY to an answer. Words that are definite, like MUST, ALWAYS, EVERY. These words in an answer should be triggers that that response is not right! Inevitably, you get down to two answers that could be correct, re-read the question. I look for part of the question in the answer, usually that is the right one! 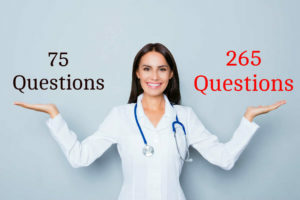 Try to answer some NCLEX Practice test, NCLEX Quiz and sample NCLEX questions. It really helps. It is not as comfortable as you think!! So practice on a computer too! The night BEFORE the test…DON’T STUDY!!!! Yes, you heard me! If you have been taking the time to study up to that point, give yourself a little break! RELAX!! Get a good night’s sleep so you are refreshed in the morning.